This year for Lent, we are experimenting with a parish-wide discipline by asking the whole church to participate in the program Meeting Jesus in the Gospel of John, a Bible study designed by The Society of St. John the Evangelist and the Center for the Ministry of Teaching at Virginia Theological Seminary. This journey into prayer and reflection focuses on the Gospel of John and 1 John. We are pleased to host two guest speakers during this season to help enhance our exploration of John. Save the date for March 17 & 18 when we will welcome Br. Keith Nelson, from The Society of St. John the Evangelist, who will lead us in a half-day retreat day on March 17 from 12:00 p.m. – 5:00 p.m., and preach all services March 17 & 18. In John’s gospel, we meet a motley crew of characters with one thing in common: each experiences a life-changing encounter with Jesus that initiates a journey of spiritual transformation. But while these journeys are personally transformative, they also liberate each character to become who God intends them to be in relationship – in a new, divine community of fellow travelers and friends. Our shared friendship with Jesus opens the door to mutual witness, reciprocal transformation, and shared union with God. 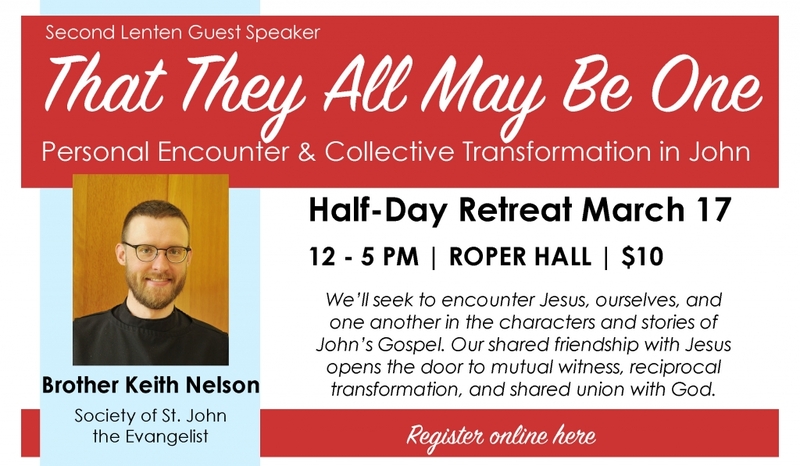 In this half-day retreat, we’ll seek to encounter Jesus, ourselves, and one another in the characters and stories of John’s Gospel. We’ll also explore the Fourth Gospel’s vision of Christian vocation as a path of personal encounter and collective transformation in the Spirit. Register online here. The cost is $10/person. Questions? Contact Mother Erin at ewarde@transfiguration.net. We are a community of men giving our whole selves over to living the Gospel of Jesus Christ. Rooted in the ancient monastic traditions of prayer and community life, and critically engaged with contemporary culture, we seek to know and share an authentic experience of God’s love and mercy. We live a common life shaped by worship, prayer, and our Rule of Life. The Society of Saint John the Evangelist (SSJE) was founded in the parish of Cowley in Oxford, England, by the Reverend Richard Meux Benson in 1866. SSJE was the first stable religious community of men to be established in the Anglican Church since the Reformation. Our order came to Boston in 1870. For many years SSJE also had houses in Scotland, India, South Africa, Japan and Canada. Now, the Brothers of the North American Congregation live at the Monastery in Cambridge, Massachusetts, near Harvard Square, and also keep a rural retreat center, Emery House, in West Newbury, Massachusetts. The Brothers live under a Rule of Life and, at profession, make vows of poverty, celibacy and obedience. On Wednesday, February 7, 2018, we welcome The Rev. Dr. Jaime Clark-Soles, Professor of New Testament at Perkins School of Theology, to give a lecture on the Gospel of John. She is a scholar at Perkins School of Theology specializing in John’s gospel, and this will give us the tools we need to begin our 40 days with John’s gospel and 1 John. The Gospel of John faces death squarely and honestly. In the story of Lazarus that appears in John 11, some in the crowd ask: “Could not he who opened the eyes of the blind man have kept this man from dying?” Both of his sisters, Martha and Mary, separately declare, “Lord, if you had been here, my brother would not have died.” In the midst of the story, we read: “Jesus wept.” How does all this fit with Jesus’ proclamation in John 10:10: “I came that they may have life, and have it abundantly”? How might John speak into our lives today when it comes to life and death? In 2015, a generous gift was given by anonymous donors-$10,000 a year for five years, to fund outside speakers and various lectures at Transfiguration. 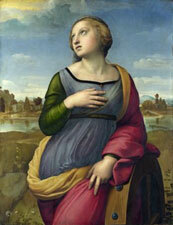 This gift was named the St. Catherine’s Fund after St. Catherine of Alexandria, patron saint of philosophers and preachers, as she herself was a noted scholar. Additionally, it is said that theologians, apologists, preachers, and philosophers called on her in prayer to intercede for them, an opportunity we might also take as we discern what speakers to invite! St. Catherine, Most blessed and favored patron saint, Thou who sought the truth with perseverance, loved the truth in humility, taught the truth in charity, and defended the truth with courage, pray for us. Obtain for us the grace to persevere in truth, to be a light in the darkness of the times in which we live, and to convey to others, both in our written words and in our actions, the responsibility, wisdom, and knowledge to proclaim the truths of our holy Faith as proclaimed by the Church. O holy virgin and bride of Christ, whose letters inspired, guided, and led the Church to renewal and transformation, obtain too for us the grace to live the truth, the patience to endure the trials and hardships, to carry our Cross in the spirit of prayer and self denial, and to defend the Church in its hour of crucifixion. We ask these in Christ’s name, Amen. On September 25 Church of the Transfiguration partnered with First United Methodist Church of Dallas to cosponsor an evening with Glennon Doyle. Glennon is a New York Times bestselling author and highly sought-after speaker who blends humor, candor, and wisdom to reveal profound truths about life and faith. On September 25 Church of the Transfiguration partnered with First United Methodist Church of Dallas to cosponsor an evening with Glennon Doyle. Glennon is a New York Times bestselling author and highly sought-after speaker who blends humor, candor, and wisdom to reveal profound truths about life and faith. 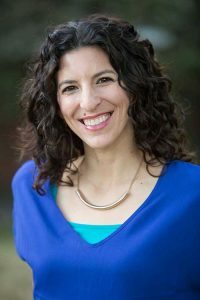 She is the founder of Momastery, an online community that reaches millions of people each week, and she is also the creator and president of Together Rising, a non-profit organization that has raised $7 million for families around the world through its “Love Flash Mobs,” which helped revolutionized online giving. Transfiguration and FUMC jointly welcomed her to deliver a talk titled “Compassion in the City,” which focused on how we can become more compassionate people and build a more compassionate society. This topic is more relevant than ever, as we discern how to resist the rising tide of extremism that has resulted in a growing number of hate groups right here in Texas. According to the Southern Poverty Law Center, there are now 55 groups operating in Texas, and the number is rising. As Christians, we are disciples of one who teaches us what it means to truly love our neighbor as ourselves (Luke 10:25-37), and how great and sacrificial a calling it is to be people of compassion. Glennon spoke from her personal experiences about this hard, beautiful work (she coined the word “brutiful” to describe when life is both brutal and beautiful), and encouraged us all to renew our efforts to change the world one compassionate moment at a time. In our baptismal covenant, we vow to continue in the apostles’ teaching and fellowship, in the breaking of the bread, and in prayer. Our catechism defines prayer as “responding to God, by thought and by deeds, with or without words.” We are, as a Church, called to a life of prayer, but that can be made manifest in myriad ways. In our baptismal covenant, we vow to continue in the apostles’ teaching and fellowship, in the breaking of the bread, and in prayer. Our catechism defines prayer as “responding to God, by thought and by deeds, with or without words.” We are, as a Church, called to a life of prayer, but that can be made manifest in myriad ways. During this five-week study in Lent we reflected on our calling to a life of prayer from a variety of viewpoints. The lectures ranged from the topic of intercessory prayer, to prayer within the monastic life, to even Jewish prayer practices that can influence and enrich our own, and much more. Guest speakers included our own The Rev. Paul Bradshaw, Emeritus faculty at Notre Dame, specializing in liturgical studies; Rabbi Ariel Boxman, Rabbi-Educator at Temple Shalom; and Adam White, Minister of Discipleship at Grace Methodist, and a Prior at the Missional Wisdom Foundation. By reflecting together about both the challenges and joys of prayer, and praying together weekly through Eucharist and evening prayer, we explored how we are formed as a community and given direction in our common prayer life, as well as how we pray when we are alone. Click on the title to listen to each lecture below. Through baptism Christians are called to participate in the prayer of Christ our great high priest. This lecture will explore how such priestly prayer is expressed in the offering of praise on behalf of all creation and in intercession for the needs of the whole world, both in liturgical services and in our individual praying. The Rev. Paul Bradshaw is Emeritus Professor of Liturgy at University of Notre Dame, and he is a former President both of Societas Liturgica and of the North American Academy of Liturgy. His book, The Search for the Origins of Christian Liturgy, has become a standard textbook for liturgical studies. Both Paul and his wife Rowena can be found in the pews at Transfiguration, and he serves on the Adult Formation Committee. In this lecture about Jewish prayer and ritual, Rabbi Ariel Boxman will discuss the Jewish prayer service and the meaning and order of the rituals practiced. She will present some traditional liturgy and introduce the audience to special melodies and chants used in the Jewish tradition. Rabbi Ariel C. Boxman, Rabbi-Educator at Temple Shalom, grew up in the Carribbean on the island of St. Thomas. As the daughter of a Reform rabbi, she was a very active participant in the Reform Movement. In 2007, Rabbi Boxman graduated from American University in Washington D.C, with a major in International Relations and a minor in Israel Studies. With a passion for Jewish leadership, pastoral care and education, Rabbi Boxman continued her studies at the Hebrew Union College and was ordained as a rabbi in 2012. Following ordination, Rabbi Boxman enrolled in a Masters of Jewish Education program and in 2013 earned her degree as a Jewish Educator. During her time in Cincinnati at the Hebrew Union College, Rabbi Boxman taught Hebrew and Judaics, wrote curriculum and supervised the teen leadership training program at the Isaac M. Wise Temple. Building from six years of experience living in the Dietrich Bonhoeffer House, a new monastic community, Rev. Adam White will discuss the role of daily prayer within a missional living context and the struggles and growth that come with it. Also, Adam will discuss the sacred dynamic of creating accountability in order to sustain a life of praying with God and others. This lecture will also address the importance of active praying as a means to engage building mutual relationships with others in our local communities. The Rev. Adam White received his Masters of Divinity at Perkins School of Theology at SMU in May 2015, and serves on the staff at Grace United Methodist Church as the Minister of Discipleship. Adam also works for the Missional Wisdom Foundation as a content writer for different publications, curriculum, and articles the organization offers. The Lord’s Prayer is central to our Christian faith. And though we may recite it often in worship, we often don’t take the time to ponder the words and phrases it contains. 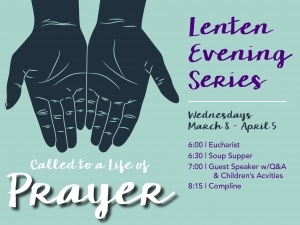 In the season of Lent, many Christians choose to deepen their own spiritual practices of prayer in one form or another. What would happen if we took up a spiritual practice of praying the Lord’s Prayer in our daily lives? Danielle Shroyer is an author, speaker and ordained pastor. She spent over a decade in pastoral leadership and was a founding member of the emerging church movement. She holds a BA from Baylor University and an MDiv from Princeton Theological Seminary. 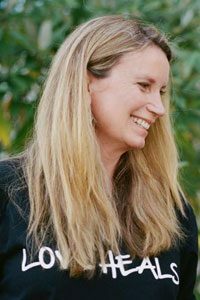 Danielle is the author of Original Blessing: Putting Sin in its Rightful Place, Where Jesus Prayed: Illuminations on the Lords Prayer in the Holy Land and The Boundary Breaking God: An Unfolding Story of Hope and Promise. You can connect with her at www.danielleshroyer.com. As we observe Lent, it is important to remember people who enter into this season at the point of great pain. In Jesus’ cry from the Cross – “My God, my God, why have you forsaken me?” —Jesus was expressing His feelings of abandonment and separation from God. If we are attuned as caregivers, we shall hear echoes of this primal cry in those we serve. It may be our cry, too. Jesus modeled a place for despair and doubt in pain. 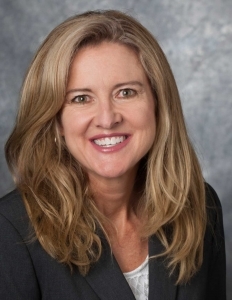 Dr. Jeanne Stevenson-Moessner is an ordained Presbyterian minister in the PCUSA and the Professor of Pastoral Care at SMU Perkins School of Theology. Her teaching specialties include issues in practical theology, pastoral care of women, crisis ministry, pastoral self-care, family systems theory, and adoption. She is the author of A Primer in Pastoral Care (Minneapolis: Fortress Press, 2005) and The Spirit of Adoption: At Home in God’s Family (Louisville/London: Westminster John Knox, 2003). She is the Editor of three pioneering books in pastoral care: Women in Travail and Transition; Through the Eyes of Women; In Her Own Time (Fortress Press). Cliché as it is, the holiday season finds even the most well-intentioned of us scrambling to get it all done, agonizing over how to make everything meaningful and beautiful in the process. Rather than a season of waiting, Advent can feel like a time of guilt and perfectionism, when every moment, present, and meal has to be done just so. Cliché as it is, the holiday season finds even the most well-intentioned of us scrambling to get it all done, agonizing over how to make everything meaningful and beautiful in the process. Rather than a season of waiting, Advent can feel like a time of guilt and perfectionism, when every moment, present, and meal has to be done just so. But Advent, in addition to being a practice of waiting, gives testimony to a deeper kind of time and meaning, and the Christ child is the very embodiment of God’s greatest gift: presence. Jesus comes to be with us, even among the harried and hurried. Danielle Shroyer is an author, speaker and ordained pastor. She spent over a decade in pastoral leadership and was a founding member of the emerging church movement. She holds a BA from Baylor University and an MDiv from Princeton Theological Seminary. Danielle is the author of Original Blessing: Putting Sin in its Rightful Place, Where Jesus Prayed: Illuminations on the Lords Prayer in the Holy Land and The Boundary Breaking God: An Unfolding Story of Hope and Promise. You can connect with her at www.danielleshroyer.com. Becca Stevens is an author, speaker, priest, social entrepreneur, founder and president of Thistle Farms. She has been featured in the New York Times, on ABC World News, NPR, PBS, and was recently named a 2016 CNN Hero.